It's Friday at the Library! 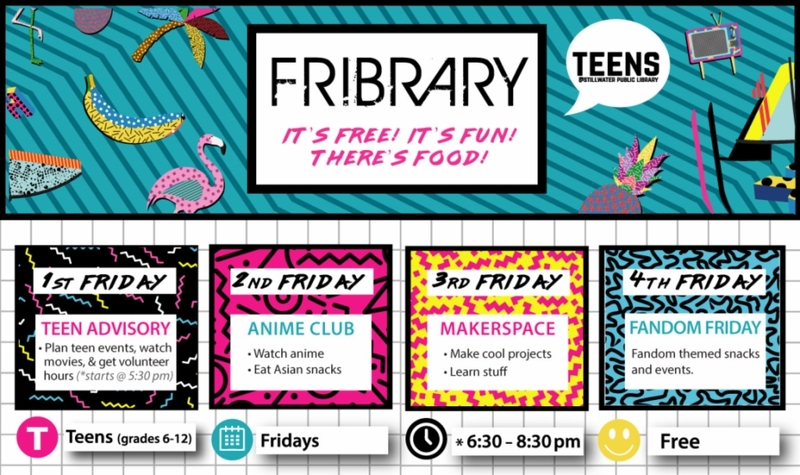 Every Friday after the library closes, we'll have awesome weekly programs from 6:30-8:30PM. If you're interested in helping decide which programs and activities the library will have for teens, then join the advisory committee! You'll need to fill out the application and drop it off at the library or email it to abell@stillwater.org. Anime club meets the second Friday of the month in room 119. Email abell@stillwater.org with your full name and grade to sign up for email reminders, or send suggestions for what you want to watch (PG-13/TV-14 and under, please)! Makerspace runs the third Friday of every month from September through April. Email abell@stillwater.org to sign up for email reminders. Fandom Fridays are held the fourth Friday of every month from September through April. April's theme is Star Wars.